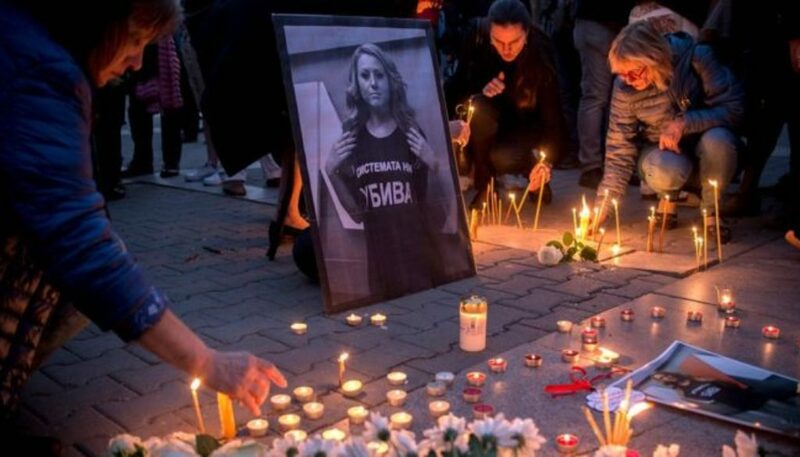 Bulgarian authorities say that murdered journalist Viktoria Marinova, 30, was raped and beaten before her body was found in a park in the city of Ruse on Saturday (6th October). The murder of the TV host and director for the regional television network TVN.bg drew international condemnation. Local media reported that Marinova was jogging in the city’s park along the shore of the Danube. Police initially said that the cause of the death were head injuries and suffocation but on Sunday Interior Minister Mladen Mladenov told media the murder was “exceptionally brutal” and that she was raped before she was killed. Marinova launched a TV show called “Detektor” in September and in the first and only aired episode she interviewed Attila Biro and Dimitar Stoyanov—two journalists of OCCRP partners and investigative outlets Rise Project and Bivol—who were detained in September while probing alleged fraud involving EU funds linked to Bulgarian businessmen and politicians. The story is known as the #GPGate scandal and the two were detained for more than seven hours after they followed a tip that crucial documents related to the #GPGate investigation were being burned in a field 50 kilometers southwest of the Bulgarian capital of Sofia. Marinova and a producer, Ivan Stefanov, were to travel to Hitrino this week to follow up on the #GPGate. Hitrino is one of the places where the alleged #GPgate suspects won a suspicious public procurement, according to Atanas Tchobanov, an editor at Bivol. TVN has been one of few Bulgarian media outlets reporting on Bivol’s investigation. It is unclear if Marinova was killed in connection to her work. “We call for an EU backed investigation and immediate police protection for Viktoria’s colleagues,” he said. Drew Sullivan, Editor in Chief at OCCRP, also condemned the killing, writing on Twitter that the OCCRP calls for an independent investigation into Marinova’s murder. International officials have called for authorities to conduct a swift investigation into Marinova’s murder. “I am shocked by the horrific murder of investigative journalist Viktoria Marinova in Bulgaria,” said Harlem Desir, the Representative for Freedom of Media at the Organization for the Security and Cooperation of Europe, in a statement. Desir noted the upward trend in violence specifically against female journalists. Marinova is the third journalist murdered in the EU this year and the fourth in the past year and half. Daphne Caruana Galizia of Malta was killed in a car bomb in October 2017 allegedly in connection to her investigative work into Maltese corruption. Jan Kuciak from Slovakia was assassinated at his home in February for his work into alleged financial crimes. In August 2017, journalist Kim Wall was also murdered while covering a story in Norway. A vigil to honor Marinova is scheduled to take place Monday. To read the original article visit the OCCRP website. This entry was posted in Blog, Europe, Illegal economy and organised crime, Memory and victims suport and tagged bulgaria, freedom of information, investigative journalism, journalists, murder. Bookmark the permalink.